It’s a cute little place set on Main Street in an old house. They have a patio that probably doubles the size of the restaurant, but we sat inside because my son was sort of overheated from all that tennis. It is a cute interior with a lot of wood. Our server was very friendly, but sadly got a little overwhelmed as the meal progressed. 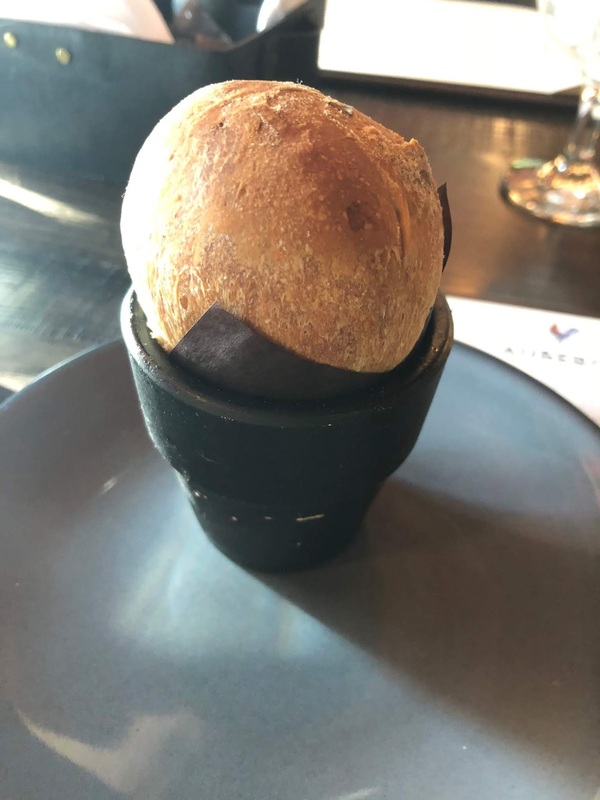 First, they bring you these little baby bread loaves baked into a little flower pot. The bread was really soft, and it was warm, and they gave you nice soft butter with it. These were very good. Hubby was thrilled they had escargot a la Bourguignonne ($12) as well. If he seems escargot, he nearly always as to order it. 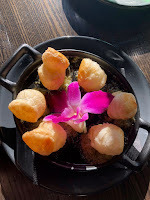 They little snails were in a rich herby garlic butter and topped with little balls of puff pastry. They were very French, and very good. Done just right. We also ordered the tuna tartare ($16), which was very good quality hunks of raw tuna. 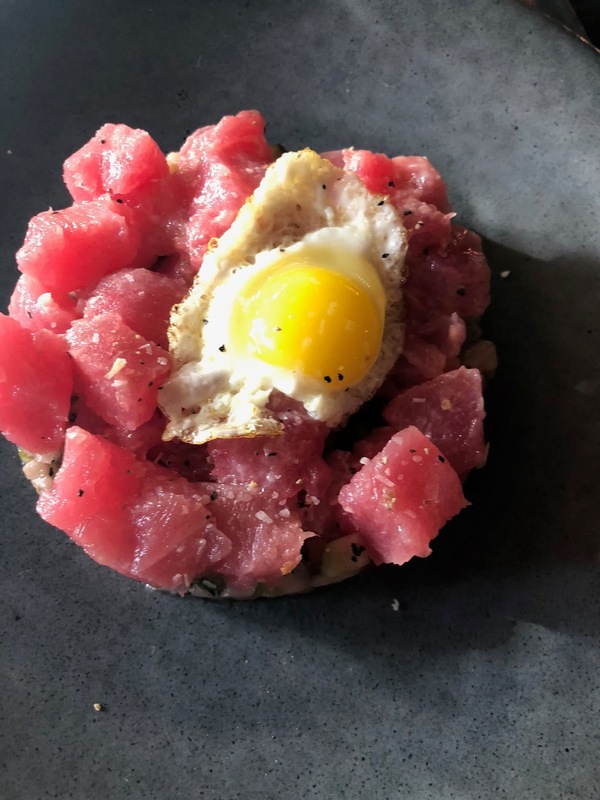 It was mildly seasoned with lemon and olive oil and served over a little salad of diced veggies and topped with a quail egg and saffron aioli. I sort of wished for a bit more of the aioli, or the lemon or something, but it was still very good as the fish itself was great, and it was at least properly salted. 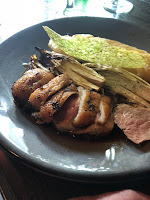 Hubby loved his duck breast ($28), which was served medium rare, and alongside Dauphinoise potatoes and braised endive with a cherry reduction alongside. 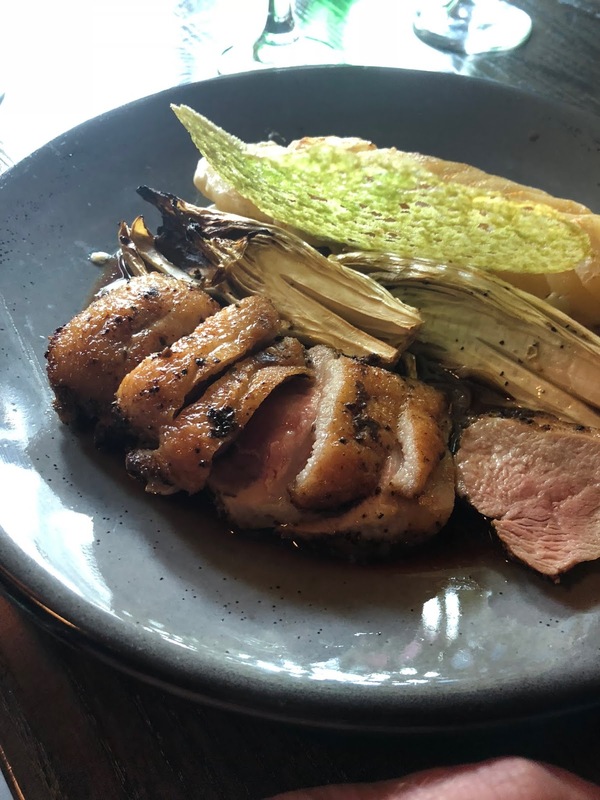 A slightly sweet, slightly tangy accompaniment is always good with duck. The potatoes were rich and creamy, and he was very, very happy. 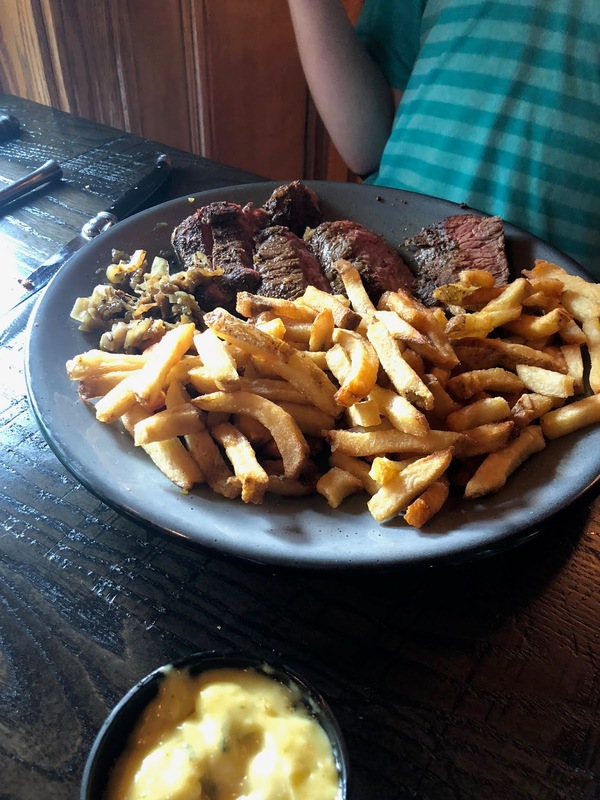 My son had the steak frites ($25), his go to at a French place, and was happy as well. 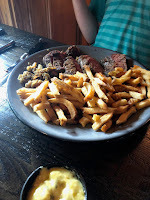 The steak was cooked as he wanted it and the lightly truffle flavored fries were nice and crisp. I loved the garlic and tarragon aioli they served with the fries. They do a very nice job with the seasonings. 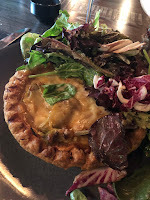 I was really torn about what to order, and I knew I would get some of the boys’ food, so I decided to try the quiche ($12). It had gruyere and broccoli and a nice rich crust (you get a whole baby quiche, not just a slice). I really enjoyed the well-dressed greens served alongside as well. I like a little tangy bite to go with a rich cheesy thing like quiche, and this one was great. 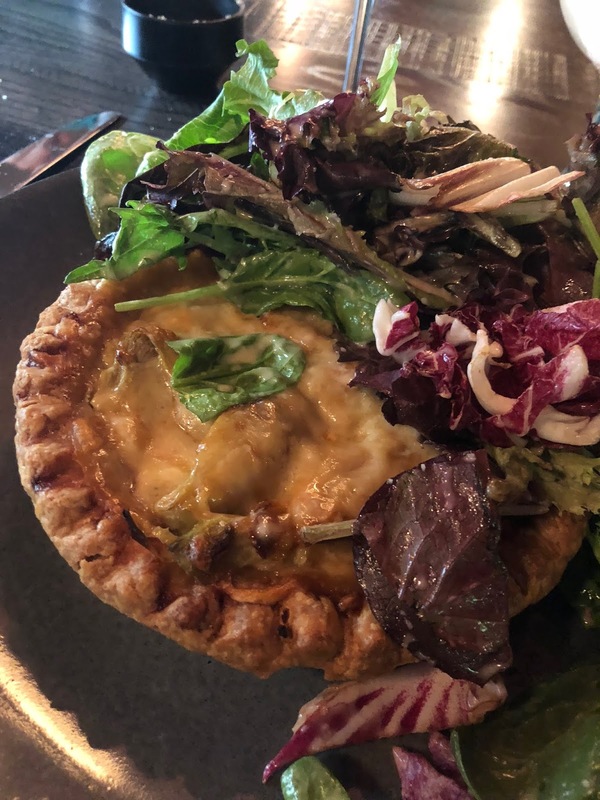 The quiche itself was probably not something I would order again, but I did enjoy it. I have my eye on the croque Madame ($13), which is always one of my favorite things, but I didn’t try this time.